Do Rabbits Live in Holes in the Ground? A rabbit's habitat consists of many variables depending on the rabbit's environment. It is essential that rabbits have a place to hide from predators and inclement weather conditions, as it is crucial to their survival and reproduction. Though most rabbits only live about a year to a year and a half in the wild (cottontails in captivity can live eight to 10 years), they can rapidly reproduce offspring and wreak havoc on gardens and lawns. A common homeowner complaint is that rabbits are tearing up their gardens and eating away at a growing garden. Rabbits are a common garden pest. Cottontail rabbits live all over the United States. The species in the U.S. include the eastern cottontail, New England cottontail, Appalachian cottontail, swamp rabbit, marsh rabbit, mountain cottontail, pygmy cottontail and desert cottontail, according to Prairie View A&M University. The eastern cottontail is the only non-native cottontail; it arrived in the U.S. before 1900, according to Mass Audubon, but it has expanded its territory to the extent that it now spans the eastern two-thirds of the country. In many areas the cottontail has become a nuisance to homes and gardens. Rabbits sometimes live in warrens, also known as dens, unlike hares like jackrabbits, which do not live in burrows. 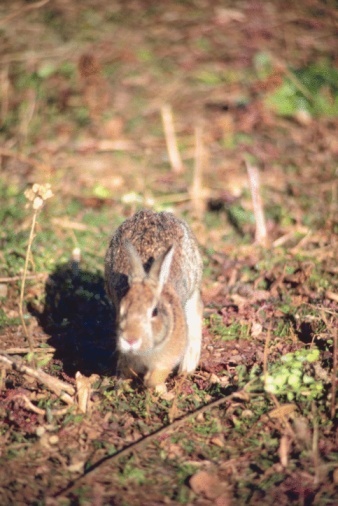 Cottontail warrens are usually borrowed from other animals such as woodchucks, according to Penn State Agricultural Sciences. The warrens consist of several tunnels with many exit and entry holes for quick escape. In each warren there are places for babies, living, bathroom and sleeping. Just like most humans, rabbits are particular about keeping an organized and clean home. Often times, such an underground home results in sink holes or a destroyed lawn. Rabbits usually live in small groups and will cover a span of 10 acres of living space. Cottontails who can't find an existing warren will use any source of coverage they can find. Often this results in having rabbits living in garages, wood piles, compost piles, or anywhere that they can find coverage and protection from predators. Unfortunately rabbits are vegetarians and have a taste for gardens. They will eat just about any source of plant based food they can find. They have been found to eat flowers, fruits and vegetables, and they even chew on wood. Dried blood or urine from a predator such as the fox or coyote can be used as a natural repellent for rabbits. You can also set rabbit traps and relocate them to a wooded area away from your home. 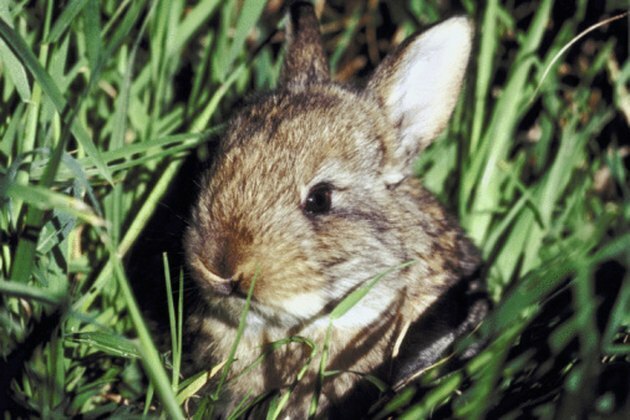 Removing brush piles and tall grass can also deter cottontails. The last resort is to call an exterminator to use poisons to kill of the rabbits. Although this is a inhumane way of dealing with the problem, some homeowners feel it is the only way to control a severe infestation of rabbits. Ms. Shannon Fry has had several articles published by several internet companies. She has also owned her own pet-sitting and rescue business for over 10 years. She is experienced in animal care and training. What Size Hole Should Be in a Birdhouse?